Many car owners are left clueless when the task of repairing a dent is unfortunately thrust before them. The easiest solution is to race to the local body shop for a conventional repair involving epoxy, part replacements, and paint. However, for many years now the prospect of paintless dent repair has become more and more popular thanks to a number of benefits. Our friends at DFW Dent Specialists have recently provided a quick cheat sheet dispelling some of the common myths and misconceptions associated with the art of PDR. Paintless dent repair is a practice of using special tools to get beneath a dent and gently massaging it back to its original form. While it may sound like a quick push and pop procurement, it actually involves a great deal of training and skill. Think of it like cutting hair. Anyone can take a pair of scissors and start chopping away so that long hair becomes short hair – but it is a form of art requiring great skill to transform the hair into a pleasing style. The same goes for dent repair. The greatest benefit of this repair approach is that the automobile will maintain its original factory paint. 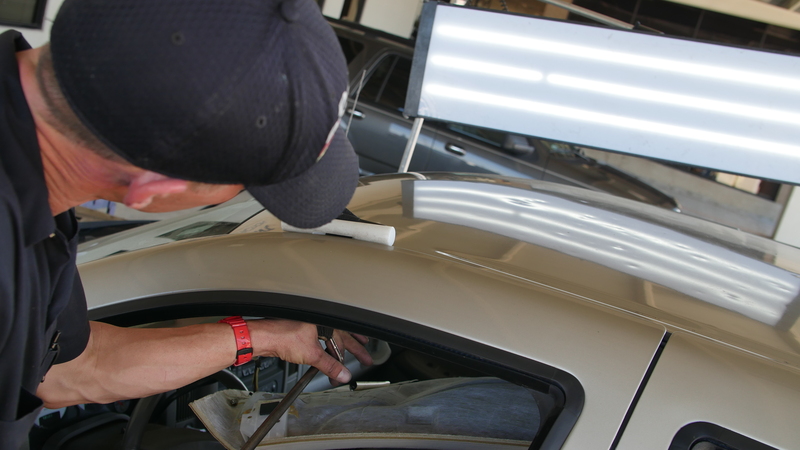 While body shops can use heating lamps when applying new paint to a conventionally repaired dent – nothing matches the quality of the baked in factory paint job. Not only does the factory paint help maintain the cars value, it also is certain to keep the appearance. The next time you are in need of a door ding removed or more extensive hail damage repaired, look to your local PDR Specialist for assistance. But one word of warning. Many “storm chasers” may pop up on busy intersection corners or under awnings after a major hail storm hits. While some are qualified, most are not. Stick with a trusted repair shop like DFW Dent Specialist (Fort Worth). Pulled from data provided by our blogging friends at Find A Vette, below you will find directory links that have been trusted by many of our customers to locate the most reputable and reliable used Corvette Dealers in their state. There is a new face in the world of Corvette blogging and news. In an area where magazine websites and bloggers have long ruled, a new approach to auto related information gathering is now making a stir. The new site, vettereport.com, is a Corvette news aggregation site that harnesses the power of the internet to bring you the most relevant daily news, articles, videos, and stories related to Chevy’s flagship sports car. The days of clicking through multiple sites, seeing the same stories, and then missing out of fresh information are a thing of the past. Vette Report is a website that filters the rumors, news, and information for you so that your valuable time is preserved without missing a single drop of info. The site’s strongest feature is that it categorizes the stories into convenient links so that you can quickly access only the information you want to see. Are you strictly interested in Corvette Z06 videos or perhaps only the latest mid-engine C8 Corvette rumors? The topics bar gives you direct access to just these stories. Classic Vettes like the C3 Stringrays also have their own page filled with events, pictures, and stories. Even off the beaten path topics like accidents, crime, and illegal street races have their place. It is this sorting mechanism that gives visitors everything they can handle in one spot. Behind the site is an engine that pulls articles from hundreds of sources across the internet. Even the most avid Corvette fan could not possibly browse through each site on a daily basis, so VetteReport handles the heavy lifting. Furthermore, instead of presenting recycled stories from sources like Corvette Blog or Corvette Online, VetteReport goes directly to the source and delivers the info unfiltered. Whether it is a press release from GM, the announcement of a massive festival, or a unique narrative review of a car, the stories are best told by their original source. Sending visitors straight to the source is a great feature that sets the website apart from others. With a growing database of content that may soon surpass long standing competitors, any true Chevrolet Corvette enthusiast should consider adding Vette Report to their list of daily sites to check! While it remains a relatively young hobby (being birthed only in the last 50 years) classic car restoration is a passion of perfection for many Americans. The concept of taking something old and making it new again provides a level of satisfaction not found in many other spare time endeavors. Now, chasing this satisfaction can come at a cost, as many classic car restorers will tell you, but the result is almost always worth the time and monetary investment. Those taking the steps down the restoration road typically start with a vehicle that they have some time of personal connection or interest in. Chris “The Doc” Ingrassia at Mustang Restoration, Inc is a primary example of this with his more than 30 year interest in rebuilding Ford Mustangs. He even has a website stocked full of videos and tutorials about the common tasks involved with this particular American muscle car. But Chris is not alone. The Ford Mustang has seemingly risen to the top of the popularity chain when it comes to classic car restorations and repairs. From this popularity a massive market of aftermarket and reproduction parts has followed suit. The availability of these parts and components has only helped to amplify the popularity. Obviously having parts available to restore your Mustang makes it a more inviting endeavor, as opposed to the days of rummaging through junk yards and traveling the country trying to track down parts. Furthermore, the mid-90s internet boom has opened up the hobby to a larger number of people that would have had access in the 70s, 80s, and early 90s. A big market with lots of people participating is the recipe for a time of growth. The Ford Mustang has remained an American muscle car icon for over half a century with it’s introduction in 1964. While the Chevrolet Corvette came on the scene about a decade earlier, and the Chevrolet Camaro a few years later, the Mustang was primed for a big launch at just the right time in a booming US economy. Since then, the stability of Ford as a company (avoiding the 2008 bailouts) and the surviving longevity of the Mustang (Camaros were discontinued for 8 years) solidified its residence in American hearts. Arguments will always rage about which muscle car is the best, but the Ford Mustang has undoubtedly shown it belongs in the discussion. A quick look at used car market availability on a site like mustang-dealers.com shows that the first generation Mustangs (made from 1964 to 1973) are still changing hands. In fact, many of them available have already been restored and are ready to be daily drivers. How many other cars from 50 years ago have more vehicles ready to be driven than ready to be restored? Considering that the generation was made for 11 years, it means that interchangeable parts are available on a broader scale, unlike the second generation Mustangs which were only made for 4 years and are much more scarce now days. It was almost the perfect storm that created the future market for the first gen Mustangs. There are certainly other classic cars that remain popular with the hobbyist restorers, like the Charger and Camaro, but you do not have to look far to realize that when it comes to restoring classic cars – the Ford Mustang is King. In the early days of car shopping a few power players took leading positions in the competition for online auto sales. Long standing auto sales magazine AutoTrader took it’s marketplace dominance to the web world with a nationwide site bringing classifieds to everyone. Other competitors, such as Cars.com and AOL Autos jumped into the game and made a splash with their sites. For over a decade the rules of the marketplace remained mostly unchanged, but shoppers failed to receive the many innovations taking place online in other industries. You see, while companies likes AutoTrader were proficient in auto sales, they were not technology companies at heart. This deficiency opened doors for new players like CarGurus to break onto the scene with a big splash. Even legacy brands like Edmunds and MotorTrend were able to gain substantial footing with websites focused on selling used vehicles. But what did this all mean for the common buyer? While many dealers continues to maintain their own websites, this caused the process of searching for a car across dealers to become tedious and tiresome. With the strongly focused classified sites like eBay and Craigslist gaining ground on those that were focues solely on the Automotive industry, the stage was set for a showdown. What would come out of the battleground would pave the way for online shopping in the decades to come. A new approach to sales would be birthed, giving car buyers and dealers the best of both worlds. That new solution was dedicated micro sites. To define it simply, a micro site is a single website dedicated to a specific brand of cars or even a specific model. The site collections listings from various sources across the web and combines them in a single place allowing shoppers to only see the specific vehicle they are shopping for. A great benefit of this approach is that the sites can specialize in the cars they are selling and give buyers the most informative look at the vehicles they seek, along with providing news and industry related information. Most micro sites are funded by advertisements, as opposed to car listings, so they are motivated to provide the best possible content to their customers without the need to monetize the listings. With the listings, pages, and site content managed by technology specialists, a clean and intuitive interface is at the forefront without the bloat of other sites. Let’s take a look at a few example sites that have tackled the new microsite approach with great success. The people behind corvette-dealers.com have launched into the world of used Corvettes for sale with great success. Focusing primarily on C6 Corvettes, they have garnered a strong position that leverages their single car approach. While their individual car listings leave room for improvement, the simple site approach has consistently proven to be a customer favorite. As the primary competitor to the Corvette, the Porsche 911 and it’s siblings have jumped onto the micro site bandwagon launching a dedicated site in 2014. Featuring nearly 1,000 Porsches for sale, a great selection is one of many features that have shoppers coming back time and time again. The reintroduction of the Camaro line has been a great success for Chevrolet with fans flocking out to buy their fifth generation Camaros. The Camaro Dealers site has capitalized on the popularity and created a site that feeds the hunger of the fans. A strong showing with the latest Camaro promises a long future for the Chevy muscle car staple. A somewhat surprising addition to this list is the quickly rising luxury brand, Audi. With the launch in 2013 of audiautodealers.com, the high class automaker began appearing in micro site searches, which continues to build on it’s brand name recognition. While industry veterans like BMW, Mercedes, and Lexus have yet to make a splash, the Audi site is at the forefront and could soon see large spikes in traffic – which also means more used car sales. What the future holds in the area of these dedicated auto sales sites is still somewhat unknown, but these players we have listed certainly are in position to make a strong run into the future of online auto sales. Corvette vs. Camaro – Which Chevrolet Muscle Car Comes Out On Top? It’s not often that Chevrolet’s pinnacle muscle car, the Corvette, is compared directly with it’s younger bother, the Camaro. A distinct pricing difference and target market makes it an apples to oranges comparison that many would not consider fair. After all, considering that the Camaro has a backseat, it can more often be considered a sporty passenger car or coupe rather than a strictly sports racer like the Corvette. However, with two passionate fan bases, comparisons are only natural, so we’ll look into them here. First, when it comes to raw horsepower, the top of the line Corvette obviously takes home the bacon with it’s superior ZL1 line. If price is not a matter of concern, then the contest goes not further. But, when you play around at the same price point the Camaro SS with it’s 425 hp is only 30 behind the base Corvette, but for $20,000 less! Is 30 horsepower worth $20,000? Not hardly. Let’s move on. When it comes to exterior and interior styling, the new C7 Corvette wins the battle without much discussion. But, this is primarily due to the fact that it has been recently remodeled by the design team a Chevy and uses the latest trends. Additionally, they learned from the interior mistakes of previous generations and were determined to elevate the class of the newest models. On the other hand, with the current Camaro generation now sitting at 5 years old, there is a good chance that a refresh is coming soon in the not too distant future. With a fresh model, the Camaro could easily turn the tide in one giant swoop. After all, the 2009 Camaro styling and design was years ahead of the often criticized styling of the C6 Corvette when it came out, especially the interior and dash. Don’t put it past the Camaro team to do it again. We’ve already touched a bit on the pricing per horsepower ration, but this is the area where personal preference decides if the Corvette takes home the victory. The low end Camaros can be purchased by the every day consumer with their sub $30,000 base models. This price point makes them very accessible to the general public and a familiar site on the roadways. The styling difference between the base models and higher end SS bodies is there, but it is small. The Corvette and it’s near $60,000 base price puts it in the hands of only those who truly can afford an elite class super sports car. In reality the Corvette is actually at the bottom of the pricing tier for the class of car that it competes with (Ferrarri, Porsche, Dodge Viper, etc.) Still, it is this final pricing factor that separates the hordes of muscle car fans into their respective classes. Those with the money for a Corvette almost always go that route. The others will choose the model of Camaro that fits their budget and then living happily with a beloved new sports car. In the used market, the tide can shift as Corvette’s can become more price permissive than the new models. Later year models in a specific generation can often be had at reasonable discounts since buyers are more included to spend the extra money for the next generation. This was particularly true with the 2004 Corvette and will likely be the case with the 2013’s as well. On the Camaro side, a used Camaro can fall anywhere in the ballpark depending on the condition and mileage. Just recently we spotted a 1991 Camaro with less than 10k miles, and at a price many would consider reasonable. It was immaculate, where other 1991’s are one step from the junk yard. In conclusion, the comparisons may rage on between these two Chevrolet brothers for many years, but the bottom line will almost always boil down to the budget of the buyer. While emotional connections or personal preferences may factor in, it’s hard to find a buyer with the money for a Corvette that would choose a Camaro instead. The king of Chevy muscle cars still reigns supreme. Audi in America – Will Audi Catch On in the US Like It Has in Europe? A recent trip to 4 countries in Europe made it very clear that the Audi line of vehicles in Europe has a strong presence unseen in the US. In parking lots, on the highways, and down common streets you could see an Audi in nearly one out of every four cars. It was obviously a popular automobile brand with our Euro carrying friends across the pond. The elegant lines, impressive interiors, and luxury appeal give each Audi an instant place alongside Mercedes, BMW, and Lexus. A certain class of driver seeks these types of automobiles to make a statement about who they are and how they live. So why is the market share so much smaller for Audi’s in the US? We’ll examine several reasons. It is obvious that pricing and additional costs associated with a luxury car can exclude many possible buyers from the market before ever stepping onto the dealership’s lot. However, as seen in other popular European makes, their are no shortage of buyers in the US who can easily afford these high class and pricey vehicles. With that being the case, the lackluster sales data and road presence for the Audi brand raises the question of what keeps them less favorable in the states. The answer? Well, we think it is only a matter of time. Brands like Mercedes date back to before World War II and that brand familiarity with the baby boomer generation gave them a head start with a generation that fits the target market. As their children come of age and advance their careers, the brand preferences has continued in the family and maintained that favorable position for Mercedes. BMW benefits from the same name recognition as a status symbol with American brand Lexus using outstanding marketing techniques to do the same for their brand. With Audi being a newer player in the game, their marketing efforts (such as those during televised professional sporting events) have made a noticeable impression on the average consumer by meeting them where they are. With brand recognition growing steadily year over year, they will soon take their place at the table with the other big players. When it comes to competitive pricing, such as the 2015 A3 sedan starting price under $30k, the Audi lineup is waging war with the longstanding veterans by lowering the bar for luxury car ownership. While refusing to sacrifice quality, this approach has historically proven to be a double-edged sword. On one hand, as an automaker, you have the unique opportunity of expanding your market share through those buyers that remain on the fringe due to pricing. On the flip side, losing the exclusivity and elite ownership status of the brand caused a tight rope to be carefully navigated with these types of moves. It is a calculated risk, but one that Audi seems poised to make. Only time will tell if the Audi dominance in Europe will make its way across the Atlantic and set up shop in the worlds largest consumer base of automobiles. While their current standing may still lag behind, the tactical marketing approach seems to be picking up steam and giving Audi of America a bright future in the United States Marketplace. Check out the best place to find a Used Audi For Sale in the US.